Evolved retailing requires effective integration of a broad spectrum of skills to deliver innovative, attractive, differentiated and profitable retail experience. 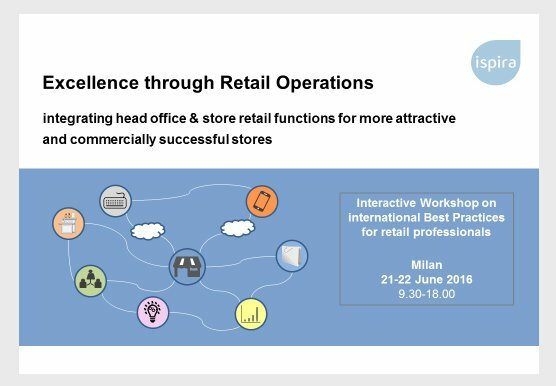 Our 2-day Retail Integration workshop is focused on all areas of Best Practice delivery of attractive & profitable stores achieved through seamless integration between head office and field functions. The workshop is designed to be relevant and to engage delegates together from different retail businesses however it can be personalised and delivered for single companies. The material is fine tuned according to the audience, the sectors and the role of attendees. Our training courses are designed to pass on our Best Practice Skills, implement evolved Procedures, increase Motivation in a pragmatic and effective way. The contents of training sessions are distilled from our project experience with leading retailers and are delivered by retail experts who have used these techniques personally for many years. Our courses are either supplied directly from our bank of pre-existing material or tailor-made according to the specific requirements of individual clients. Our aim is make all our training sessions as near to reality as possible. This helps participants to really understand how to apply tools and techniques and to improve beliefs for instant performance improvement. For this reason at least 50% of training time is spent on exercises, role-playing, simulations, and discussion.